K.J. Parker is a big enigma in the world of Fantasy. No one is even quite sure if Parker is a man or woman, but most think female. Whatever the case Parker has yet to disappoint me with the crafting of tales. Last year I thoroughly enjoyed the novella Purple and Black and when I first heard the title of Parker's second novella for Subterranean Press, Blue and Gold, I immediately thought this would be a sequel of some sort or at least placed in the same world. As far as I can tell the two stories aren't related in the least. "Well, let me see," I said, as the innkeeper poured me a beer. In the morning I discovered the secret of changing base metal into gold. In the afternoon, I murdered my wife." While Purple and Black went for the unusual style of letter correspondence Blue and Gold goes for the first person POV of an unreliable narrator. 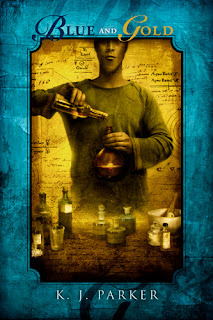 He is an alchemist. Maybe the best in the world. Maybe not as he contradicts himself from page to page. I'm not giving anything away by mentioning this. The main character reveals this himself on the second page. "I'm Saloninus, by the way. And I tell lies, from time to time. Which goes to prove the old rule; never entirely trust a man who talks about himself in the third person." Saloninus is not a self-aggrandizing rogue you'll love to hate. There are lots of those out there in Fantasy nowadays. I simply fell in love with his voice as he pulls punches and still stabs daggers into many backs all in the name of survival and some would say selfishness. The story jumps around during many of Saloninus's many escape attempts while also mixing in directions on alchemical formulas and philosophical debates, which show off Parker's imagination and also research skills. At first I thought the recipes would bog down the story, but the voice of Saloninus is so strong he could have been telling you about his trip to the market yet makes every word said riveting. Blue and Gold is the black comedy cousin to The Usual Suspects with its unique take on the science of alchemy and a murder that might not be. Sly humor is effused throughout with quips and outright lies that starts and finishes strongly. Blue and Gold surpasses the other short fiction I've read from Parker and is one of her most memorable pieces to date. I give Blue and Gold 8.5 out of 10 hats. Even once finished you'll question exactly what the true story is beneath all the deceit and slight of hand, but you'll do so with a big grin. I can't wait to see what Parker has in store for us next, especially with the The Hammer coming out early next month.